There are many service choices available. Our close-knit team will guide you and your family to choose the best option based on your needs and desires. Whether choosing traditional burial options or cremation, our staff will provide a personalized, unique tribute honoring your loved one. We are focused on placing you on a healing path. We will thoughtfully listen to you, encouraging you to share and talk about your loved one. Throughout our time with you and your family, we will be a guiding hand helping you make the right choices. We also have healing tools such as our family guide that will help you begin to walk back down the path of your loved one’s life. Working together, we will co-create a unique and memorable experience that will help you reminisce and celebrate the life of your loved one. You will feel the warmth from our staff as soon as you walk through our doors. We are here to serve you and help you through this very difficult time. We are a family-owned business and you will see the care and comfort of families is at the forefront of what we do. We provide a relaxed environment and our facility is beautifully decorated and welcoming. Our focus is on providing you and your family, friends, and guests a healing and personalized experience. 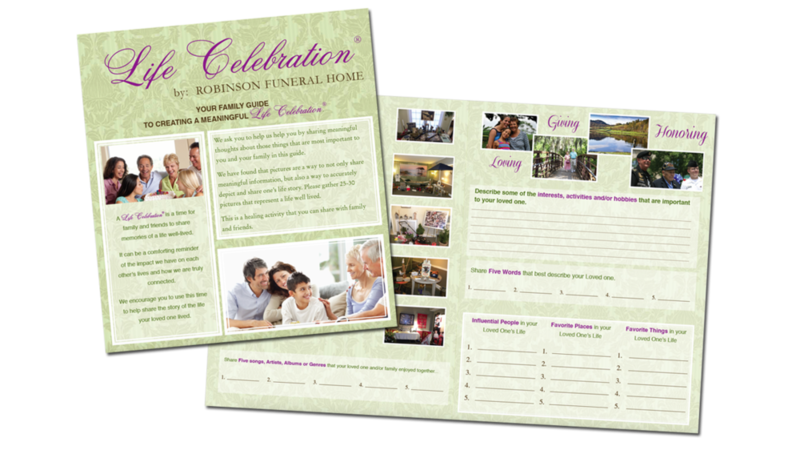 We create an atmosphere that encourages sharing memories, telling stories, and celebrating the life that was lived. Remembering the good times and walking back down the path of your loved one’s life will help you heal. Let us help you remember. At Robinson Funeral Home, we believe that every life deserves to be honored and celebrated. It is our duty to share stories for a final time. We encourage our client families to help us co-create these memorable tributes; you will find that walking back down the path of your loved one’s life becomes a healing exercise. The Family Guide is the primary tool we give our families to begin the story sharing. View the guide below to see how we get to know more about you and your loved one. After you complete the guide, we will do the rest to provide an exceptional experience.